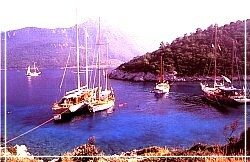 For the type of Blue Voyage we offer, you dont have to hold a skippers license, nor do you need to be an avid sailor. We provide you with a traditional wooden yacht which you charter with crew. If you cannot get a group together so as to take your own yacht, you still have the opportunity to join one of our weekly cabin charter cruises. You might even like to go for something racier, like a standard-sized bareboat with an English-speaking skipper. Most of our yachts are of the traditional wooden variety, built either in Bodrum, Marmaris or the western Black Sea region. You will find a number of them pictured on the following pages and additional information is available in our Tariff Sheets. During the day, we cruise for a few hours and sail if the wind allows. Closer to lunch or dinner, we approach the land and drop anchor in a solitary bay, alongside a small village or off an island. At every stop, and there will be at least two per day, there is the opportunity to swim, fish, snorkel, windsurf, sunbathe, take a trip ashore or just read under the shade of the sun awning. The accent is on relaxation and recreation. We offer diving tours for people who wish to explore the depths off the coast in the company of an experienced dive master. Bring your friends and make a group or join an organized tour. Our guests are advised that they will be spending most of their time in a bathing suit so it is a good idea to bring at least two! For land trips, a pair of long, light trousers and a shirt are advisable. Evenings may be cool, certainly during the earlier and later months of the year, so you are best to bring a pullover and a windbreaker. We also suggest you pack your beach towel, plenty of suncream, snorkels/flippers/goggles if you plan on doing lots of snorkeling and a sleeping bag if you are planning to sleep on deck. Bed linen and towels for use in the cabins are provided by us and you should expect a set of sheets during the hot summer months and a bottom sheet and a pique (thick cotton sheet) during the spring and autumn months. Your Turkish crew may not have a thorough knowledge of English, so you might be advised to take a small travellers dictionary along with you for the cruise. Besides being understood more easily, it is also a great way of picking up a few words of Turkish.